The discussions will be held at the Seven Tuns, Chedworth, where lunch can be purchased. For further details contact Katharine Leach at the Organic Research Centre or William Waterfield as above. One of the aims of the meeting is to identify objectives and participants for participatory research on mixed swards on organic and low input dairy farms, to be conducted as part of the SOLID project. 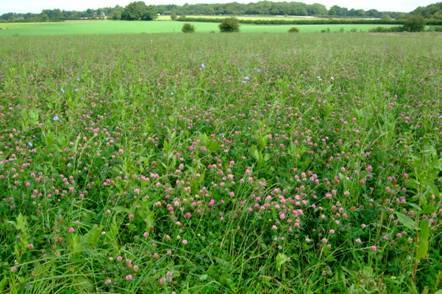 Improving productivity from home produced forages is key for organic and low input farms. Diverse swards and herb-rich leys are seen by some as offering ways of improving sward performance, drought resistance and animal performance. Farm Manager Rob Richmond has been growing herbal leys for the past six years and over the last three has increasingly adopted a mob grazing system. The farm walk offers a unique opportunity to view this novel approach to dairy pasture management. After lunch there will be the chance to discuss how this system might be incorporated onto other farms and to join a European-wide research project. What do you want out of your swards?